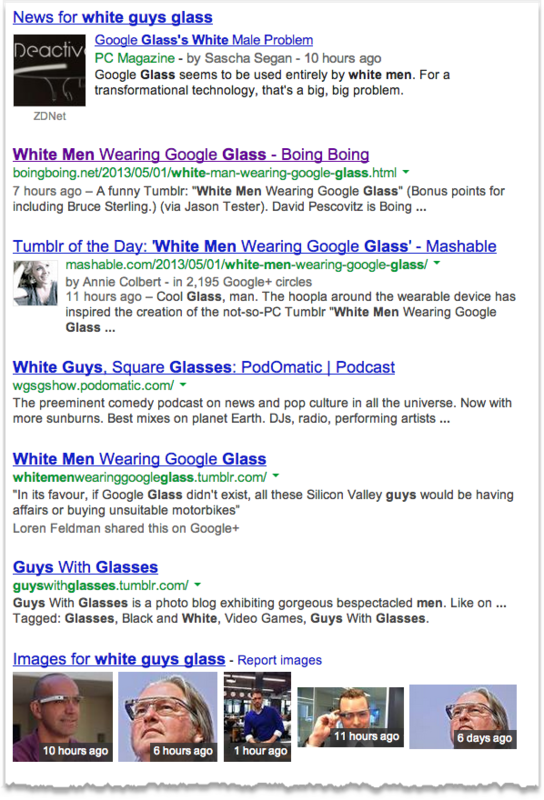 The "White Guys wearing Google Glass" is a killer meme, a potential product killer. A friend who is a prominent geek, always a bit of a rebel and very comfortable with self-promotion, is very concerned about posting a picture of himself wearing Google Glass. He just got them and was super excited to finally have them, and he told all his social networks about it days in advance. When they finally arrived he told his friends he couldn't post a photo of himself wearing them for fear of turning up on rapidly proliferating sites(above) specializing in photos of "White Geeks wearing Google Glass." I suggested that he try "black face" but that would probably set off another rush for domain names and specialized sites, and make his predicament worse than if he'd stayed natural. However, if my friend is concerned about posting a picture himself, of himself wearing 'Glass, what about other geeks, what about any of them wearing their 'Glass in public? They will all be live fodder for anyone out there. Their photos, of a white guy wearing 'Glass will end up online, sooner and later -- and not in a good, cool kind of way. There are solutions, one is to only wear them at home in private, watching out for open windows and curtains. Or in public, but wearing large, black sunglasses to hide the interior 'Glass. Those types of sunglasses can be found at medical equipment stores and don't require a prescription. Memes such as these can be product killers. Google knows how to track memes with services such as Google Trends. But does it know what to do in response to negative sentiment, and how best to boost 'Glass? Here's how Google can help boost 'Glass wearers: encourage diversity within geek communities and workplaces -- starting with a radical new hiring policy at Google. By helping to build diversity within geek society and its sub-cultures, it will be great for business because it will mean that a "White guy" meme can't be stuck onto any Google products, or its brand. Apple can have it back. It would be a smart business move because it saddles Apple, a formidable competitor with a big problem. It'll be solved by Apple, in turn, by building diversity into its brand, and so on, in a domino diversity tumble across a global industry, and it might actually result in something great. All because of "White guys wearing Google Glass."